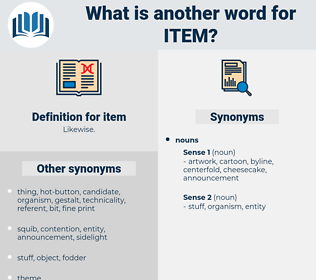 What is another word for item? systems, characteristics, Suggestions, aspects, remnants, Quantities, highlights, Guidelines, coordinates, amounts, Rights, point, Forms. specifics, initiatives, objectives, participants, parameters, purposes, Classifications, sites, Negotiations, perspectives, deliberations, Measures, methodologies, Undertakings, subjects, mechanisms, observations, arguments, candidates, competitions, allegations, attractions, differences, comments, projections, Trademarks, discussions, performances, procedures, packages, minds, disciplines, briefings, contributions, Categories, regions, problems, secrets, Attitudes, offerings, conclusions, notes, experts, tools, practices, IMPACTS, reviews, Facilities, strategies, tasks, games, pledges, reactions, schemes, provinces, Standards, insights, Ideas, speakers, Voices, contracts, stages, tribunals, ventures, figures, opinions, Copies, results, Children, Policies, levels, uses, touches, Sports, views, Ones, cases, changes, plans, degrees, needs, signs, Oils, Parties, places, heads, PTS, Fears, accounts, aspects, holes, Rights, point. coordinates, aspect, subitem, point, ingredient, artifact, dossier, connection. Mentioned, highlighted, outlined, identified, described, considered, involved, addressed, included, Told, Discussed, Devised, raised, Was, Were, Pioneered, found, Referred, Happened, Claimed, signed, lit, covered, Asked, added, Dealt, Got, felt, said, Questioned, point. appreciated, Compiled, articulated, completed, finalized, Drafted, damaged, designed, finalised, advanced, formulated, refined, Devised, poised, Worked, Screwed, Viewed, focused, laid, Looked, point. continues, Tests, presents, Comes, involves, includes, reflects, provides, relates, raises, is, Rests, Has, leads, deals, Worries, goes, lays, Does, needs, Fears, point. theme, themes, sections, issues, project. concerns, themes, sections, issues, updates. concerns, theme, sections, updates, project. compound, entirety, summation, aggregate, totality, composite, total, conglomerate, whole, sum. The most agreeable item he saved for the last. But it now became apparent that he regarded himself not only a necessary item in my welfare, but as being most essential to the achievement of my designs. custom-made, disposable, piece, number, part, custom-built. 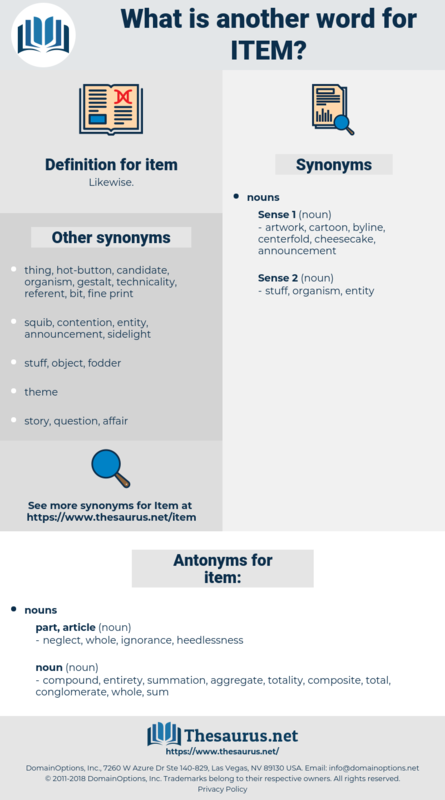 incidental, agenda item, line item, position, inventory item, news item, place. portion, component part, constituent, component, part.